Coffee, crepes and cetaceans are indeed a heady brew and this was our concoction for a wondrous day at Eagle Eye! Our warden, Albert decided we were due for some crepes for breakfast after our hike up to the cliff. But first we needed coffee to wake our tired limbs before we started our scans of the Bight and surrounding area. The steaming goodness warmed us and eased us into our day. As we surveyed the Bight, A lbert cooked us our delicious crepes, which we smothered in maple syrup and indulged in the view. Taking in the breathtaking beauty across from us we began to hear the distinctive blows of orca approaching from the east! Our excitement mounted as we realized that the orcas were traversing right under us at the cliff! 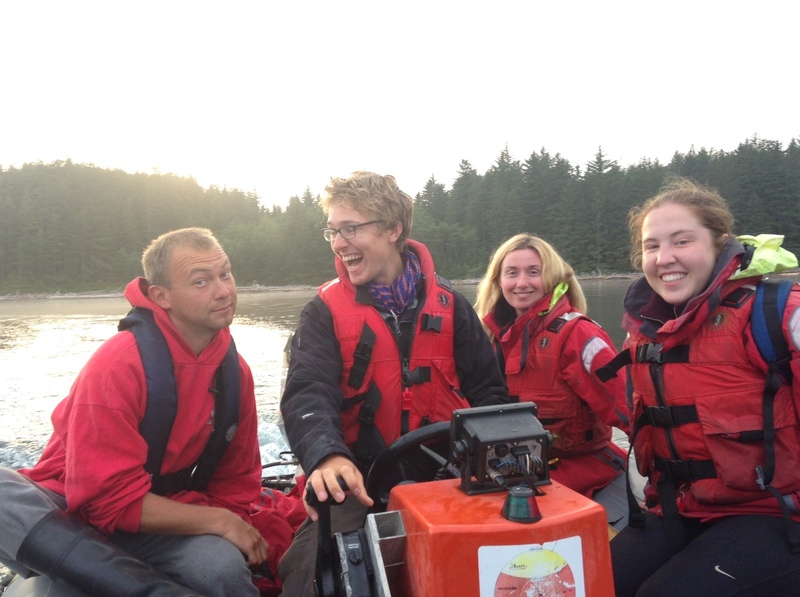 Marie, our eagle eyed le ader and warden rapidly recognized the orca as the residents known as the A23’s and the A25’s! We watched in wonder as they glided smoothly towards us, their breathing punctuating the air like an exclamation mark! To add to this incredible experience, we realized that a pod of approximately 40 Pacific white-sided dolphins were approaching us from the west! The dolphins seemed to be aware that the orca were dead ahead of them. With that, they sped towards the orca at top speed and proceeded to leap all around them! They tracked the orca and continued to buzz around them like flies! Whether the orca were annoyed by their smaller cousins, is open to interpretation. 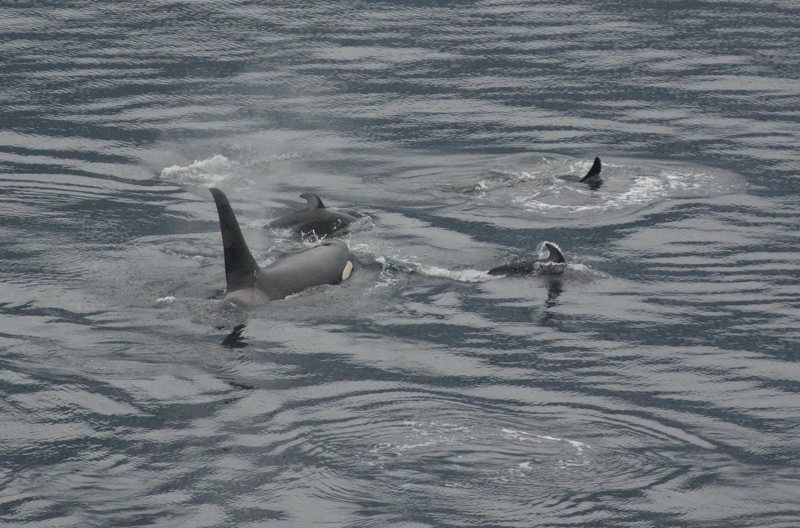 The orcas continued on their trajectory west, bypassing the dolphins and we watched both parties on their way. A solo Steller sea lion happened to pass under the cliff just as the dolphins were leaving. The sea lion and the dolphins got a fright as neither appeared to be aware of the other! 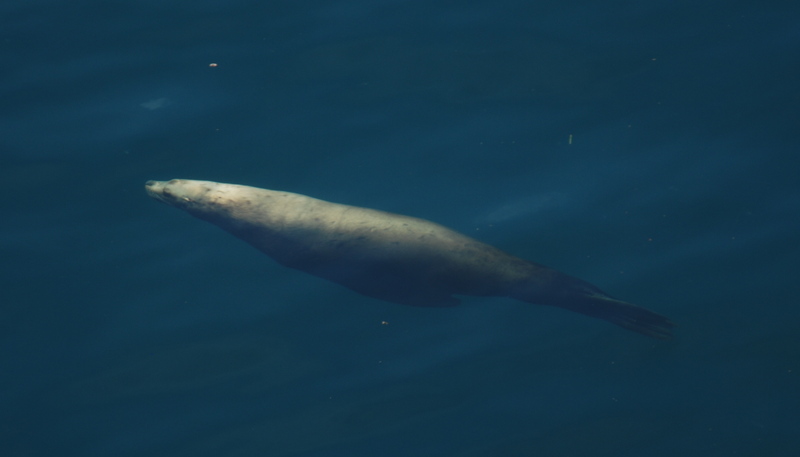 The sea lion leapt out of the water as it almost swam headlong into the dolphins. It popped up suddenly and then did a deep dive, swiftly dodging these acrobatic lovelies. In the afternoon we were delighted to have the kayaking group ‘Spirit of the West’ hike up to Eagle Eye. 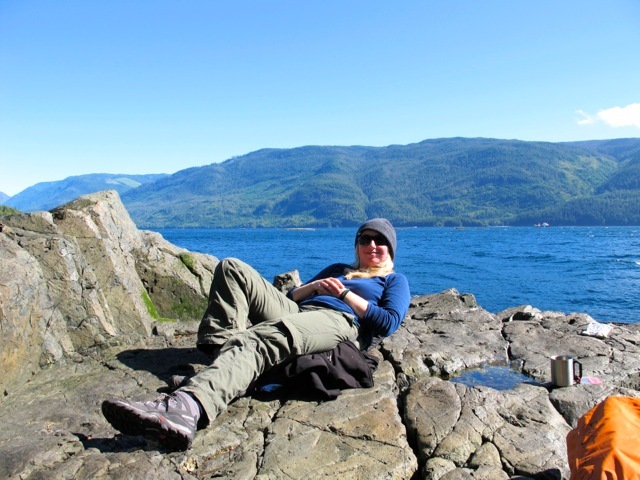 Marie talked about the Robson Bight (Michael Bigg) Ecological Reserve and the orcas. Ernest, our cultural interpreter talked about his people, the ‘Namgis (aboriginal people of the area). They invited us along to their camp to enjoy their company, hot shower and hot tub! We graciously accepted as our showering facilities are a tad limited at camp and we definitely are lacking a hot tub!! After dinner, we putted out on our Zodiac to the Spirit of the West camp. Ernest greeted them in his native tongue Kwak’wala as we approached their camp. We spent an incredible evening enjoying a fantastic hot shower with gorgeous views on the water. After a fun evening with the camp guides and their guests we proceeded to the hot tub. We clambered in and submerged ourselves in the steaming hot water and looked out on the Bight as the sun set. My senses were overwhelmed with all of the incredible treats we were experiencing today.